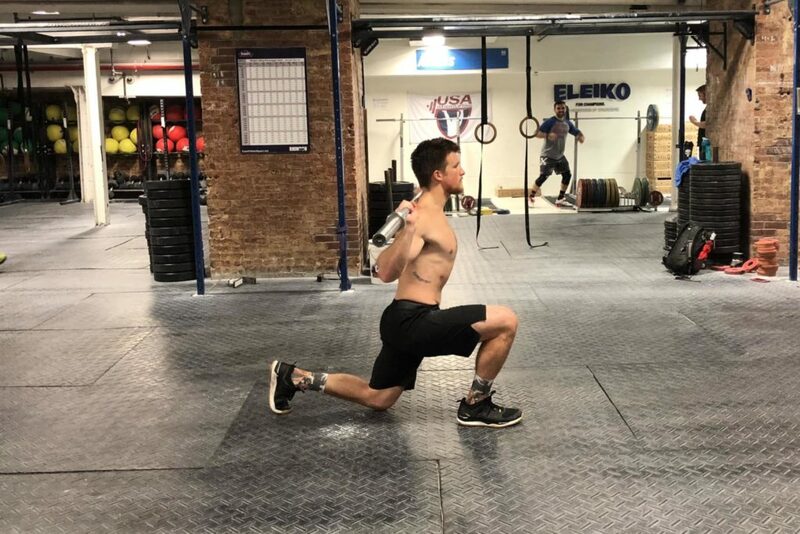 The reverse lunge is a unilateral exercise than can be used to build strength, muscle hypertrophy, and enhance movement mechanics for strength, power, and fitness athletes. While most athletes spend a good amount of time training the squat and deadlift, the reverse lunge (and other unilateral leg exercise) should be incorporated into a strength training program to maximize muscle development, decrease movement imbalances, and increase injury resilience. Step 1: Start with the barbell on you upper back/traps, similar to a back squat. You can do this from the rack or simply cleaned and placed across the back. You can also choose to place the load in the front rack positions (depending on your variation). Step 2: Set the back and place the majority of the loading in your right leg as you step your left leg backwards. The distance you step backwards will depend on the amount of hamstring and quadriceps involved. Be sure to step back enough that your back left knee (when on the ground) is in line or behind the right heel. Step 3: With the hips loaded underneath the torso, and weight properly dispersed in the right heel and midfoot, stand up with a vertical torso. You may have a slight forward lean with the torso, similar to an angle that would happen in the back squat. Step 4: As you stand back up, bring your left leg back to the original position. The lifter should maintain proper balance and avoid leaning or loss of balance throughout the movement. Step 5: Repeat for repetitions on each leg either in alternating fashion or complete all one side, then switch. Be sure to follow the sets, reps, and loading guidelines listed below. The reverse lunge targets the muscles in the lower body, primary the ones below. While there are other muscle groups that may be affected based on loading (for example front rack reverse lunge vs overhead reverse lunge), the below muscles are worked the most. The hamstrings are used to eccentrically control the load as the lift descends as well as help to extend the hips in deeper reverse lunges. Like most lunges, the hamstrings, glutes, and quadriceps are targeted. The glutes work to extend the hips and stabilize the movement as a lifter descends down into the reverse lunge. Additionally, glute activation and strength can play a role in knee stabilization. The quadriceps work to extend a flexed knee, which can be targeted to a greater or lesser extent based on the distance at which a lifter steps backwards (longer step back will result in more hip flexion rather than knee flexion, hence less quadriceps involved). Additionally, a lifter can perform front foot elevated reverse lunges (see variations below) to increase the range of motion and quadriceps involvement. Below are three (3) benefits of the reverse lunge. Note, that most lunging variations can enhance lower body strength, stability, and function on a unilateral basis. Unilateral leg strength and muscle development can enhance overall leg strength and performance. By addressing unilateral training, coaches and athletes can decrease the asymmetries and imbalances that may exist that affect a lifter’s positioning, stability, and strength in a movement. Lastly, by enhancing unilateral performance of the lower body, you can help to minimize overuse or compensation pattern that can result injury. The hamstrings and glutes can be targeted to a greater extent when a lifter take a deeper step backwards behind them, lengthening the distance between the back leg and lead leg. In doing so, the lifter must allow for greater hip flexion which places greater loading on the hamstrings and glute muscles. The reverse lunge can be modified (smaller step back, which forces greater knee flexion) to target the quadriceps to a greater degree simply by increasing the amount of knee flexion in the lead leg. In doing so, a lifter is forced to stay in a more upright position and use the quadriceps to extend the knee. Who Should Do Reverse Lunges? Reverse lunges are a movement that can impact all athletes and lifters. The below groups can use the reverse lunge to specifically enhance movement and strength in their respective sports. Strength and power athletes can use the reverse lunge as a unilateral leg exercise to assist in the development of the quadriceps, hamstrings, and glutes. In addition, this can be used to address movement imbalances (such as hip shifting in the bottom of the squat) and muscle asymmetries. This exercise is great for athletes in that it involves unilateral stability, strength, coordination, and balance. In addition to those attributes, this exercise can be good for developing unilateral stamina and muscle endurance when done in higher rep fashion with restricted rest periods. Runners, cyclists, and other endurance athletes should train unilateral lower body exercises on a regular basis as this is highly sport specific. For general fitness and wellness purposes, the reverse lunge can be used to increase lower body strength, muscle development, and increase stability in the knee and hip. 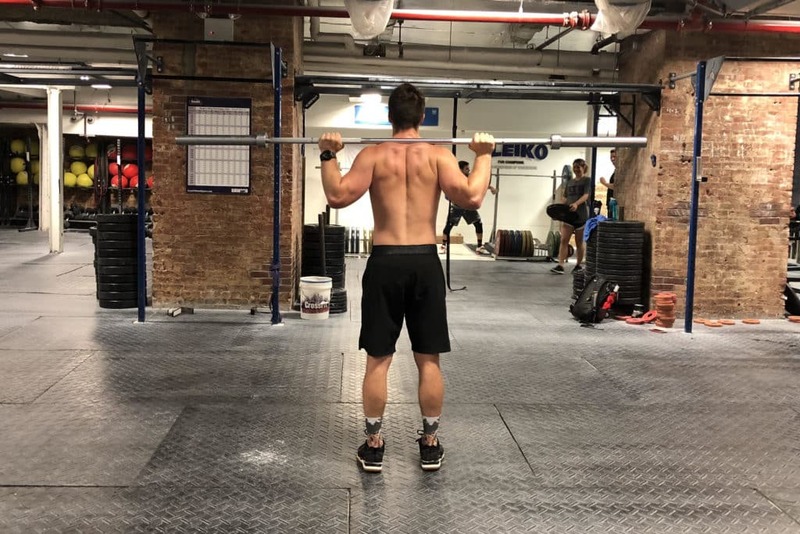 While squats and deadlifts are important, some individuals may have back issues or cannot assume proper mechanics while performing these movements. The reverse lunge may be a good movement to substitute or add into a general fitness program to establish better movement, muscle development, and stability. Below are four sets, reps, and weight (intensity) recommendations for coaches and athletes to properly program the reverse lunge specific to the training goal. Note, that the below guidelines are simply here to offer coach and athletes loose recommendations for programming. The reverse lunge can be used to develop a lifter’s basic understanding of a lunging and squatting movement. It is a foundational pattern for establishing unilateral leg strength, balance, and stability. This should be done with a light to moderate load for moderate repetitions in a controlled fashion to instill proper control and coordination. Training the reverse lunge for muscle hypertrophy should include a moderate to high amount of volume with a moderate to high amount of loading. The below rep ranges can be used as general guidelines to increase muscle hypertrophy of the glutes, quadriceps, and hamstrings. While the reverse lunge is often not trained with heavy and near maximal loads, lifters can use moderate to heavy loads in the below rep ranges to increase unilateral leg strength. The below ranges can be used to increase leg strength. It is important that the lifter remains in control throughout the entire motion. If the load is heavy, it is highly recommended to have a spotter or set oneself up within a squat rack for safety purposes. Never overload this movement, always air on the side of caution. The reverse lunge can be done to increase lower body endurance and stamina. The below rep ranges can work best for this type of goal. 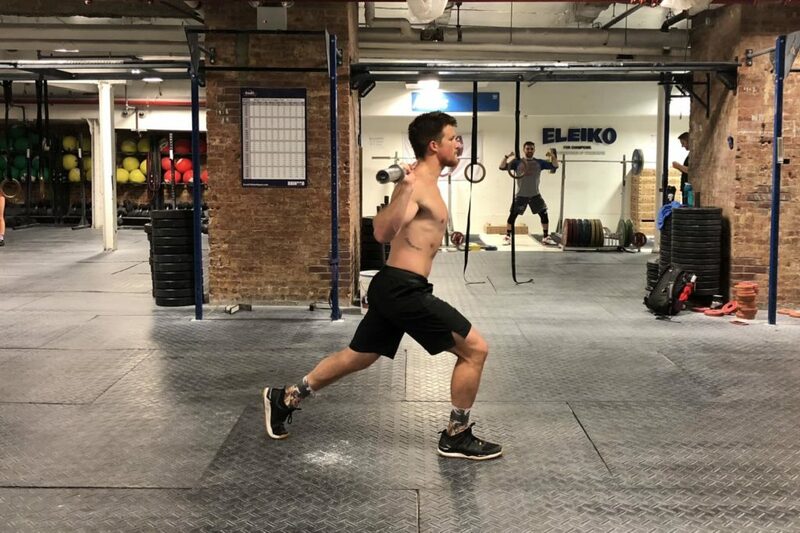 Below are three (3) common reverse lunge variations that can be done to increase unilateral leg strength, challenge movement patterning, and enhance overall lower body performance. The front rack reverse lunge can be done using dumbbells, kettlebells, or a barbell simply by placing the load up on the front of the body. By assuming the front rack position, you challenge core stability and force the lifter to stay upright throughout the movement. In doing so, the lifter must control and coordinate the reverse lunge without allowing the chest to fall in the movement, targeting the glutes and quadriceps. By elevating the front foot, the lifter can increase the amount of knee flexion in the front leg during the reverse lunge. By stepping backwards to a deficit, the lifter must remain in a more upright position in deeper knee flexion, which will help to increase quadriceps engagement. The crossover reverse lunge is done by having the lifter step backwards and slightly behind the body (on a diagonal). In doing so, the lifter must control the amount of knee valgus (knees buckling in) which challenge hip stability. This is a good movement for lateral stability as well as targeting the glutes. 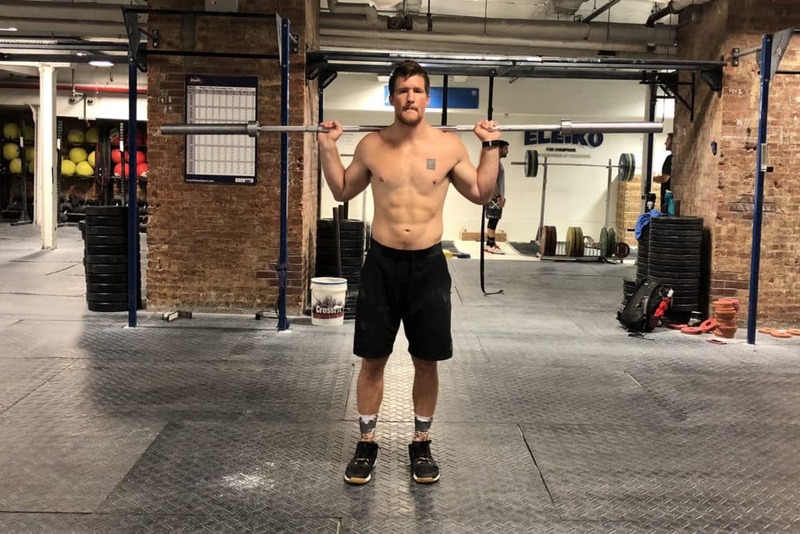 Below are three (3) common reverse lunge alternatives that can be used interchangable with the reverse lunge to develop leg strength, unilateral stability, and lower body performance. The Bulgarian split squat is a unilateral exercise that can develop leg strength, hypertrophy, and improve squat performance. This exercise is done by placing the back leg on a bench or other supportive surface and descending down into a lunge, target tgin the glutes, quadriceps, and hamstrings. The split squat using suspension bands/TRX bands is a challenge exercise that forces a lifter to increase lower body stability, enhance motor unit control (due to the added instability of the movement), and increase both eccentric and isometric strength and coordination. The lifter places their back leg in the stirrup, and slowly descends into a lunge, placing the large majority of the loading demands on their lead leg. The walking lunge challenges many of the same muscle groups as the reverse lunge, and demands great control and coordination. Unlike the reverse lunge, however, the walking lunge is dynamic, which will require greater balance, stability, and control. 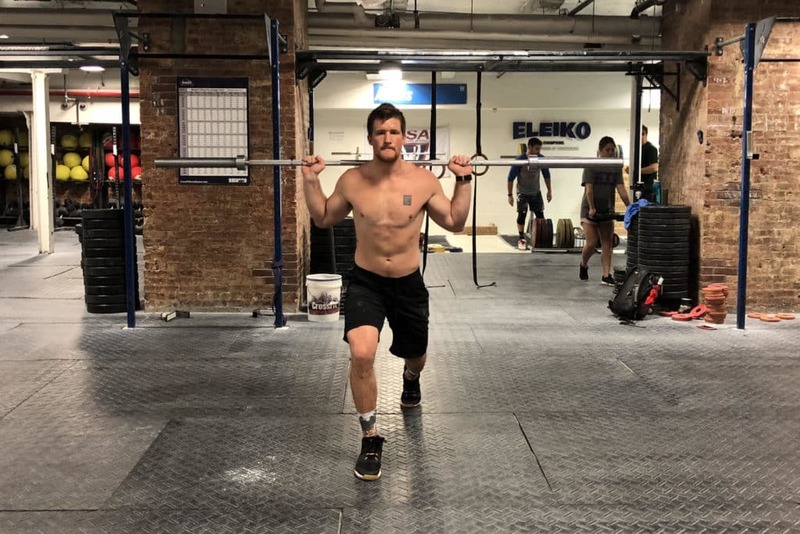 Some lifters may struggle with proper walking lunge mechanics, and therefore should perform this only after mastering the other two above alternatives.